The indexing continues with a look at the only movie to ever combine the celebration of Valentine's Day with the gritty world of mining. 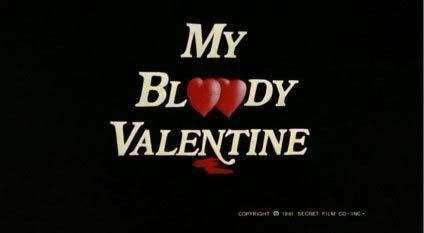 Awhile back a friend from my old job mentioned to me that she had recently rented the 1981 holiday slasher flick My Bloody Valentine and remarked that she had been surprised to find out that it was Canadian. Being the obnoxious geek that I am, I explained to her that it must have been one of the infamous "Tax-Shelter Films" from that period. In the 70s and 80s, in an attempt to boost the Canadian film industry, the federal government decided that anyone who invested a certain amount of money into the production of a feature film could write off the amount from their taxes. This did in fact result in the bankrolling of many Canadian movies, but the problem was that rather than put their money into serious and important films, these tax-shelter investors preferred to produce movies that actually had a chance of turning a profit and allow them to make some money out of their tax dodge. As a result of this a majority of the Tax-Shelter Films ended up being low-budget genre films just like the one currently up for discussion. But unlike most of the films from this strange period in Canadian cinema, My Bloody Valentine stands out because rather than deny its Northern origins, it embraces them almost to the point of unintended self-parody. Fearful of alienating American audiences, the majority of films shot in Canada (even to this day) are either set in specific American locales or in nameless, unidentified places where all hints of Canadiana are carefully kept away from the camera. This is definitely not the case with this film, though, as it could very well be THE MOST EXPLICITLY CANADIAN MOVIE EVER MADE. Seriously, the only way the movie could be more Canadian would be if the killer turned out to be a beaver in a hockey mask who killed his victims by stuffing Timbits down their throats. And in case any movie producers are reading this, THAT is a movie I would very much like to see. From the general hoser behaviour of its characters, the maple syrup thick Canadian accents (I swear I actually heard several examples of the fabled "a-boot"), the constant references to Moosehead Beer and a cast filled with familar Canadian actors (including Don "The Voice of Mok" Francks and Cynthia "Not Quite As Hot As Her Sister Jennifer" Dale) My Bloody Valentine isn't afraid to wear its country of origin on its sleeve, even though it does avoid mentioning it specifically. In fact this aspect of the movie is so strong, it's difficult for me to judge it in terms of a general audience. Frequently I found myself so enthralled by the blatent Canuckness of it all, that it never occurred to me whether or not a non-Canadian might find it as amusing as I did. I admit that to the eyes of a foreigner, My Bloody Valentine could be just another lame slasher movie with some odd accents and a cast of smalltown characters who strangely never talk about football. I, however, loved every minute of it. Though I have in the past admitted that I love many of the more obvious slasher movie cliches, I also enjoy it when a movie attempts to subvert them, even if just a little. To that end, the movie changes things up a bit by featuring a cast of 20-something actors who are actually playing 20-something characters, rather than the usual overaged teenagers. And rather than taking place at a college/private school/summer camp the film is set in a small mining town, which gives the picture a distinctly blue collar tone not normally seen in the genre. 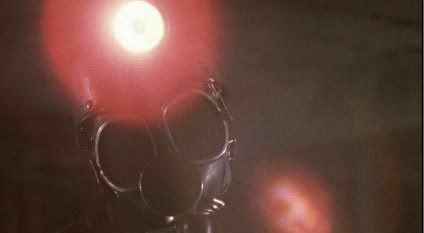 In fact the film's setting is so unusual, that one cannot help but assume that it was chosen only to credibly provide an excuse for its maniac killer to don his effectively unsettling miner costume of dark overalls, gasmask, flashlight helmet and pick-ax. 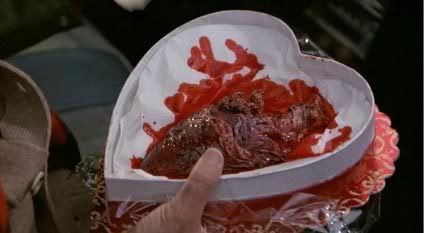 That said, the killer's obsession with a particular date--in this case February 14th aka Valentine's Day--is straight out of the slasher handbook, so all is not completely out of whack. 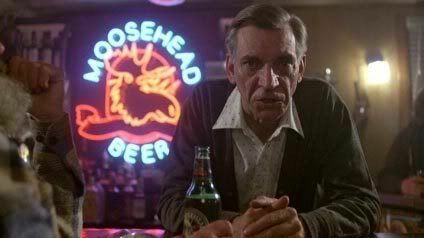 As the film's requisite Creepy Old Man tells the skeptical young miners who hang out in his bar, there's a reason why the town hasn't held a Valentine's Day dance in 20 years. It all began when two foreman--eager to leave work so they could get cleaned up and go to the dance--left six miners alone in the mine, all of whom were trapped when a methane leak caused an explosion. It took six weeks to clean up the rubble and only one of the six miners was found alive. 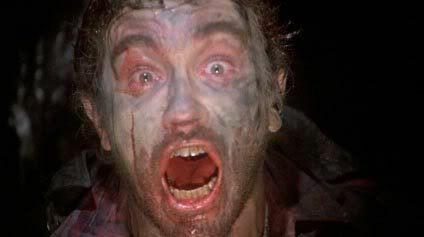 Harry Warden, having lost his mind during the ordeal, resorted to cannibalism to survive and was more than a little pissed at the two foreman who left him and his friends alone in the mine that Valentine's Day. Wearing his workclothes, he killed the two men with a pick-ax befor being caught and sent to the nearby mental hospital. Since then all of the town's Valentine's festivities had been canceled, out of fear Harry might escape and return to mete out further vengeance against the town. But after two decades the story of the killer miner has become the stuff of boogeyman legend and everyone assumes it is safe to start celebrating the holiday of love once again. It goes without saying that they are mistaken. Given the nature of the holiday the movie is centered around, it's only natural that a part of its plot is devoted to a love triangle. T.J., the film's nominal hero (if only because he manages to survive all the way to the end) is the mayor's son who has returned to the town after failing to make it on his own "out west." During his absence he left behind Sarah (who also survives, but can't accurately be described as a proper Final Girl) who--never knowing if or when T.J. was going to return--started dating Axel. Sarah is clearly torn between the man who left her and now wants her back and the man who's been with her ever since T.J. went away, while the audience has trouble figuring out why she's attracted to either of them. I suspect many folks will find these more dramatic sequences difficult to sit through, but I found myself much taken by the low-rent CBC-ness of it all. It doesn't hurt that in the final scenes T.J. wears an open shirt, neck-bandana ensemble that is hilariously mesmerizing to behold. Obligatory Has Beens: Anyone who calls Don Francks a has been is looking for a mess of fists in their face! References to Moosehead: Too many to humanly count. Amount of Time Required to Correctly Identify Killer: The film fails to provide a crucial clue until the moment of revelation, so you might actually be surprised. I guessed correctly about an hour in. Utterly Pointless Trivia: The movie's ending was deliberately left open for a sequel and director George Milhalka did actually try to convince Paramount to produce a second film in 2001. They decided to pursue different projects.